WHY SHOULD YOU USE THE REVOLUTION HYBRID ? 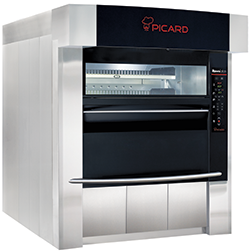 Because this oven takes up less of your kitchen space and offers an ergonomic design so you can double up on quantity. This added to an extremely efficient burner system helps you economize on multiple levels, reducing your operating cost. The Revolution oven’s compact size is only one of the many w ays that this oven is revolutionizing the history of revolving ovens. 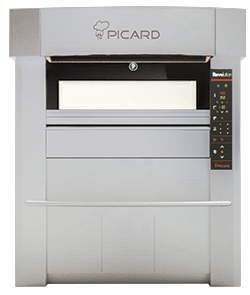 Picard has become famous for providing some of the industry’s most innovative and durable ovens. We continue this long tradition by making the Revolution simple to clean, impervious to rust and trouble-free to operate. Count on your Revolution to provide you with years of hassle-free service.